Is there anything better than October? 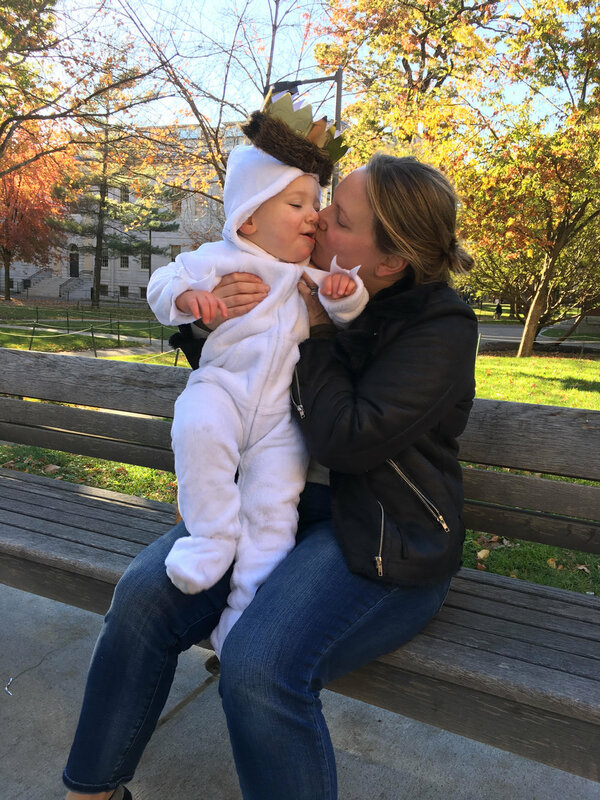 Everyone has settled into new routines, the weather is (generally) cooler, the leaf peeping and apple picking are in full swing, and it’s finally acceptable to buy enormous bags of candy and maintain the fiction that they’ll last until October 30th. KIDDING! I would never pretend that that candy is making it to the end of the month. But really, we are trying to maintain a modicum of healthy eating now that we’re super busy again with school and activities and the faster pace of non-summer months. That’s where sheet pan dinners like this one come in handy. 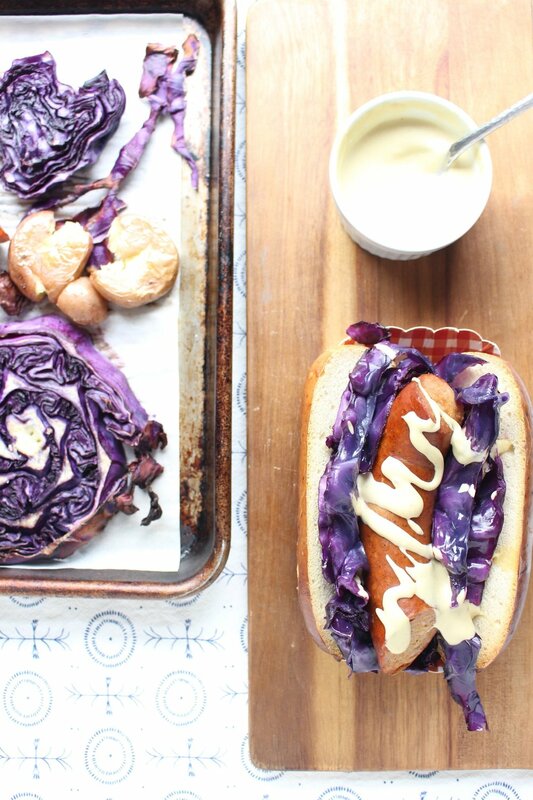 The combination of sausage, cabbage, and potatoes with a mustard-y sauce feels very Oktoberfest, which is obviously on-brand for this month. Also, I haven’t yet found a vegetable that wasn’t made more delicious by roasting and purple cabbage and potatoes may be among my favorites. Find the smallest potatoes you can, or halve anything larger then a golf ball. If you leave off any bread on the side and check your labels for the sausage, this dish is also gluten-free, dairy-free, and Whole 30 compliant. A quick note about the sausage here: We always pre-cooked sausage. The timing gets tricky when starting with raw sausage and the chicken/turkey varieties are usually pre-cooked anyway. 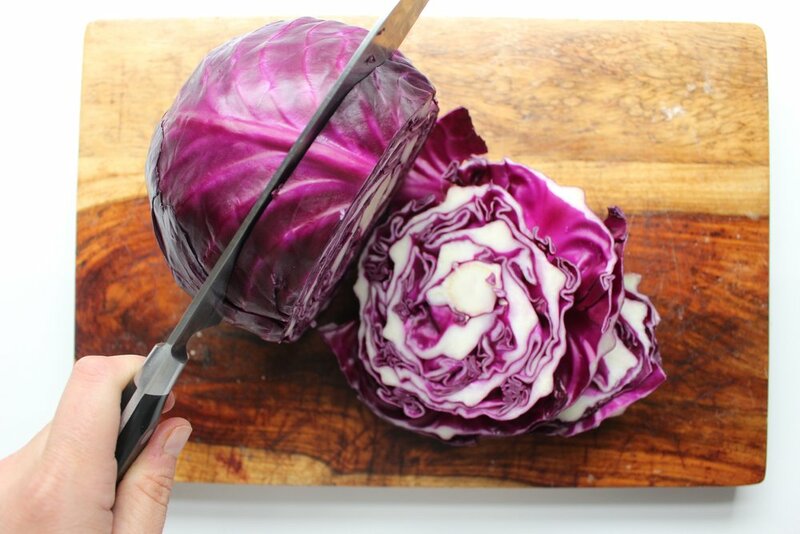 Thickly slice the cabbage into ¾ inch thick steaks. Spread out on your baking sheet along with the small potatoes. Brush or spray with olive oil. Sprinkle with salt. Cook for 20 minutes or until the cabbage starts to singe in the sides. Remove the sheet pan from the oven and tuck the sausage in with the potatoes and cabbage. I have cooked the sausage from frozen and when already defrosted, and it takes about the same amount of time. If desired, smash the potatoes slightly with the bottom of a mug or measuring cup and spray or brush on more olive oil for a crispier, crunchier potato. Return to the oven and cook for 10 more minutes or until the centers of the cabbage steaks are fork tender.